Disclosure: I received the following products from HABA for review. All opinions are my own. With the weather here in Southern California reaching the high 90's, we have been enjoying summer a wee bit early. I am a huge fan of HABA toys as they are quality made and provides countless hours of play. They have outdone themselves with the perfect treat for when the sun is out. My kiddos love ice cream and frozen treats. However, many of the store bought ones are full of sugar and other unpronounceable ingredients. I didn't realize how easy it was to make popsicles until Hubs made some watermelon ones the other week. It was pure, fresh watermelon and ice. 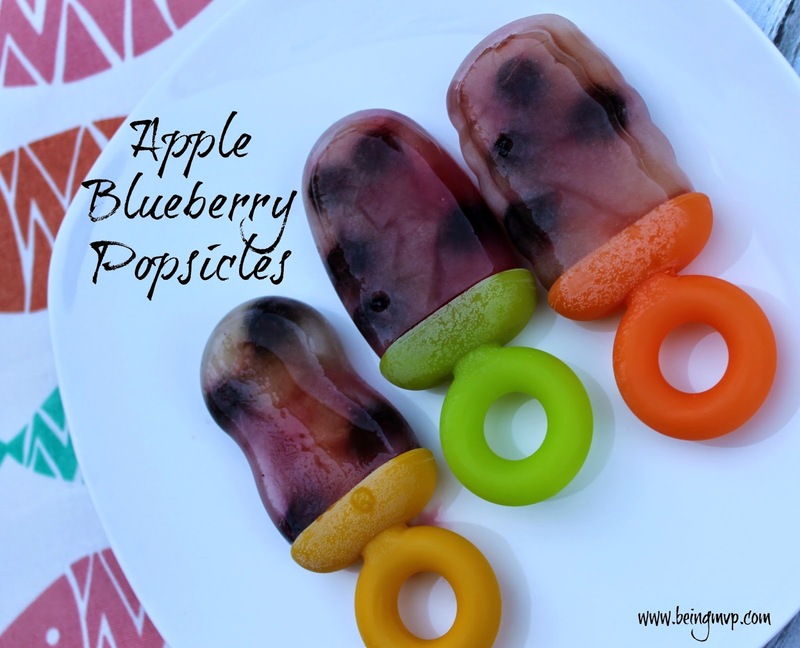 The kids love these however since our popsicle mold was standard size, it was messy because they couldn't finish before it melted. 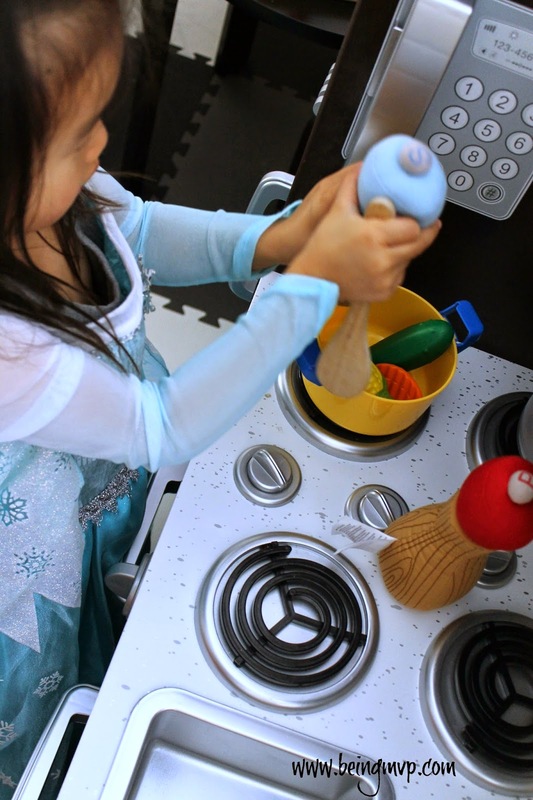 HABA's silicone popsicle molds provide the perfect solution plus they are loads of fun. There are 4 molds on each tray with a small handle that Mason and Kenzie can both hold with ease. 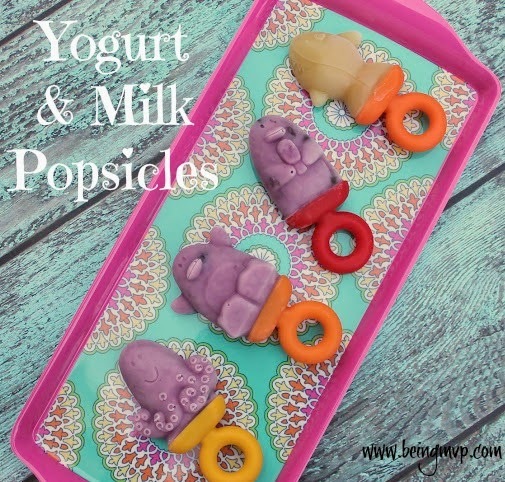 The penguin popsicle molds are fun in itself even when simply making yogurt popsicles. There are two penguins, an octopus and a fish. Kenzie gets a kick out of these and since she is having a yogurt treat, I don't mind when she asks for a second. Mason just gets excited he gets a popsicle that is just right for his size. He asks for them in the morning and after dinner and gives me a huge smile that melts my heart when he asks so how I can say no? These are so easy to use in that you just fill with whatever you like (make sure not to flood over to the handle side) and pop into the freezer. No need to loosen the mold with hot water trying to only get the water on one popsicle. These just pop out quickly individually directly from the freezer without leaving any residue on the mold. How amazing is that? Check out my Popsicle Pinterest board I just created after receiving these fabulous molds. The silicone ice cube molds are also fun for the kids and it encourages them to keep hydrated in the scorching heat. Kenzie enjoys helping me in the kitchen with the molds. 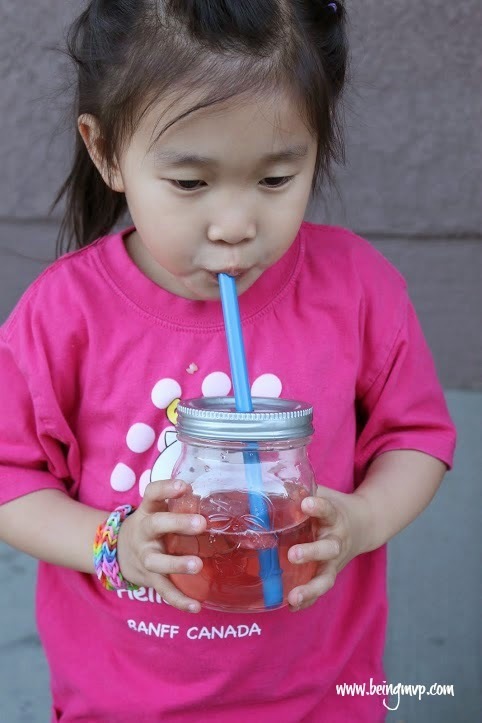 They are fun and easy to fill and are the perfect addition to even plain water. What kid wouldn't love a shark or ice cream cone floating around in their cup? Now I just need a larger freezer to accommodate all the molds (with our food) at once! As you probably already know, Mason loves to cook and was ecstatic to see the Ketchup & Mustard bottles because he is a pro dipper. These are shaped exactly like the bottles in the fridge and when you open up the top, you can squirt some onto your foods. Mason gets a kick out of it but keeps on asking me (or Kenzie) to fix it so he can squirt again. I must admit that I do give the task to Kenzie after he asks me more than 10x. When he grills this summer, he needs to have these on hand! Kenzie likes flavorful food and was inquisitive when examining the Salt and Pepper Grinders. They are plush yet make the grinding sound just like mama's! 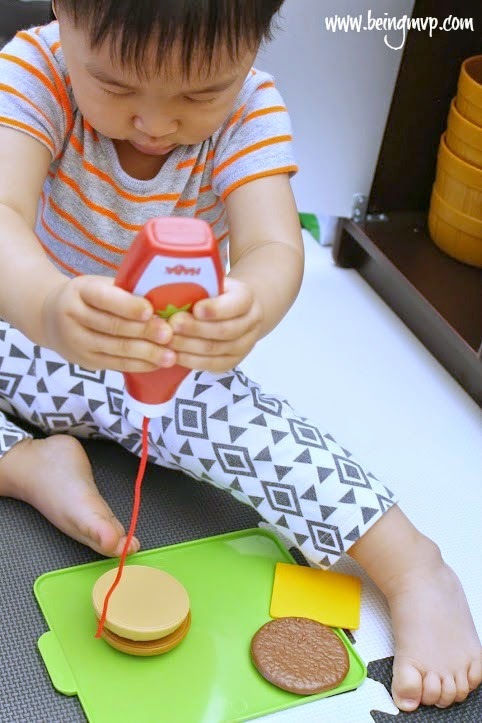 These are so much fun and add a new dimension when in the play kitchen. 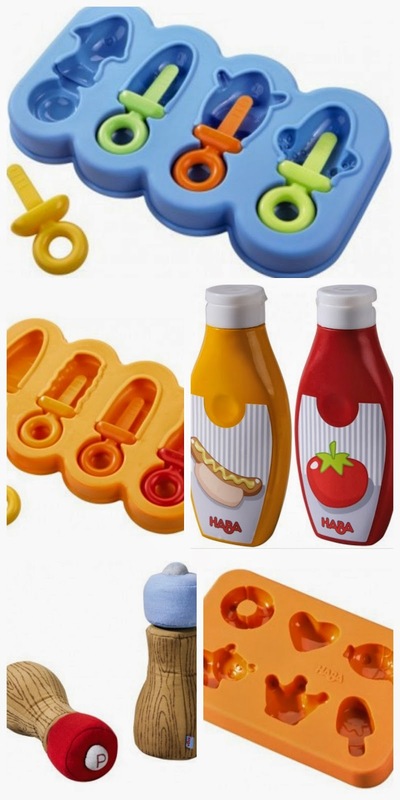 HABA really hit the spot with these products for summer. Every child will be able to have fun indoors and out. Make sure to connect with HABA on Facebook, Twitter and YouTube. One winner will receive the same set of products ($80+) from my review! I love the 1001 Nights Magnetic Arranging Game and we are hoping to buy our first house this summer. I like the ABC Sand Molds and our summer plans are spending time at the beach. we are staying cool with our water table and at splash pads. We hope to spend a lot of time at the swimming pool this summer. From HABA we would also love the Nelly doll. So fun!!! I love the Allegro Stacking ball and we are planning to relax this summer! I like the optics set. I have no summer plans. I like the get to know your animals puzzles. I hope to take my grandkids to see the ocean. I love the aircraft swing they have for babies. We plan to spend some time at the beach and visit family this summer. I love the Ball Tracks! We are planning a trip to the white mountains in New Hampshire. I like the my first ball track and we are going to visit family in Alaska this summer. I love the dolls and we are going to the beach! I also like this game from their site; Matching Game Who Lives Where? We just got back from going to visit Myrtle Beach, S.C. The weather was awesome and the food was great! I like the MOOVER Dump Truck Red and we're planning on lots of play dates at the park this summer! This looks like fun! Starter Set with Water Seesaw. We love the beach! I would also love the Annie Doll for my daughter! We don't have big plans for this summer, we want to go camping, fishing and take the girls to the zoo! I like the Jessica - 18 inch Doll, Blonde - Gotz. Right now we don't have any plans other than dd's ballet workshop in July. I would love to get the Stacking Cubes and other puzzles for toddlers for my grandson. I also like the MOOVER Rocking Horse Red!! The Beach Set would be great as we head off to the beach this summer. I'd love to get the Play Tent Rose Fairy for my daughter, it is so pretty and would be so magical to a kid! This summer we are going on camping and day trips to the lake and river. I also like the ABC Sand Molds! Our summer plans are to visit family (live so far away). I like the chef stove top and pans. I like the Nelly doll because my granddaughter is named Nellie. I plan to spend as much time with her as I can this summer. She is almost 2 and so much fun. I love the Nelly doll, I will be having a baby soon! I like the Moover Doll Pram. No summer plans yet! gotta work! i love all the lilleputians! especially ophelia and her chicks! I like the Baroque Architectural Blocks. :) We are just hanging out at home this summer. Airy Fairy Baby Swing for my son, and we plan on swimming alot! I also love the Pushing Car Walker Wagon! We don't have any set summer plans, we try to go to the river and canoe a couple times a month and take at least one camping trip with the family! Marcel - A Game of Touch looks like so much fun! We are heading to Indiana this summer to visit grandparents! i like the Vegetables Shopping Net from haba. My summer plans are to take a vacation and go to visit family and to hang at the beach alot. I like the Doll Mirli. My summer plans are to go to the beach as often as possible!